This article is about the film. For the play by Louis Nowra, see Così. Cosi is a 1996 Australian comedy-drama film directed by Mark Joffe. Louis Nowra wrote both the screenplay and the play it was originally based on. The story is loosely based on Nowra's own experience at producing Trial by Jury at Plenty Mental Hospital in suburban Melbourne in 1971. Cosi was directed by Mark Joffe, and produced by Richard Brennan and Timothy White. In 1996, Cosi was the 3rd most popular Australian film at the Australian Box Office. 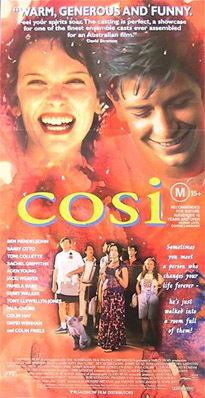 As at 2010, Cosi ranked 71 on the list of Top 100 Australian feature films of all time as compiled by Screen Australia. David Stratton, writing in Variety, described Cosi as "fast, funny and cleverly acted". He also said it was "warm, generous, sentimental and expert entertainment." The curator at Australian Screen Online said it "has a likeable humour, appealing characters and a compassionate heart. It's not really about mental illness so much as a tribute to the healing power of performance, and the theatre in general." Not all reviews were positive. James Berardinelli described Cosi as "a half-baked amalgamation of A Midwinter's Tale and Shine, and doesn't excel as either a comedy or a drama." Cinephilia described Cosi as "a concatenation of caricatures in a predictable story of plucky determination and treacly redemption." Cosi grossed $2,896,980 at the box office in Australia. ^ a b Stratton, David (25 March 1996). "Cosi". Variety. Retrieved 22 August 2010. ^ Byrnes, Paul. "Cosi 1996". Australian Screen. Retrieved 22 August 2010. ^ "Film Victoria – Australian Films at the Australian Box Office"
Gillard, Garry (2001) H231 Australian Cinema: Unit Information and Study Guide. Perth, Murdoch University Press, p. 65. Malone, P. "Cosi" – Review in Cinema Papers, No. 109, April 1996, p. 41. O'Regan, T, (1996) Australian National Cinema, New York/London, Routledge. Smith, M. "Running the Gamut" in Cinema Papers, No. 109, April 1996, p. 6. This page was last edited on 12 August 2018, at 10:08 (UTC).